Almost any Chinese dish can be prepared using your normal pots and pans, but if I were to pick one utensil from a whole selection of Chinese cooking equipment, the Wok would certainly be up on the list. Why? 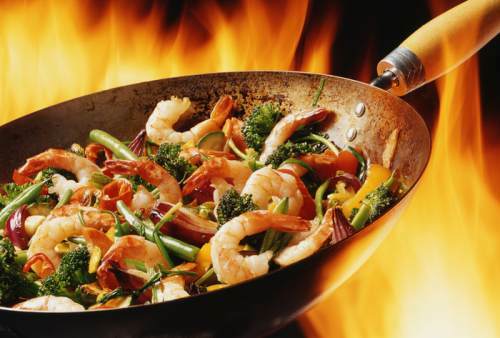 What makes cooking with a wok so special? The tall thiner walls provide the quick intense heat necessary for frying and the round bottom shape keep the ingredients at the center where the heat is higher. Also it is much easier to toss and turn the food without it falling all over the place, and it uses minimal amounts of oil for frying. That makes it the preferred Chinese cooking utensil for any recipe that calls for the stir-frying technique which is often used in Chinese cuisine. Cooking with a Wok with gas or electricity? The original wok is designed with a round bottom, and a Chinese kitchen has a bench with holes where the woks would fit. Below the bench is the fireplace where wood is burned to provide the heat. 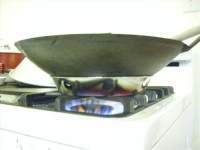 In a Western kitchen, a wok is best used with gas because the flame will heat up the entire wok quickly and evenly. The rounded bottom is not great for the flat stove tops but you can get a wok ring that keeps it in place. Depending on the size of the wok, the ring can also be used upside down to get that flame to cover as much of the bottom of the wok. You can also get a wok with a flat bottom, this is probably best for electric stoves as well because it maximizes the contact surface. We have an electric stove and can achieve excellent results with a flat bottom wok, just turn on the burner on to high and place the wok directly on it. Buying a Wok: Steel or Iron? One long handle or two short ones? What size Wok is best? Nowadays there are many kinds of woks available in the market: stainless steel, cast iron, teflon, one long handle, two short ones, rounded bottom, flat bottom... so what should you get? When shopping around, you will find that wok prices range from the inexpensive to the super deluxe gourmet models. We have tried several different types and have achieved great results without spending a bundle. A carbon steel wok is probably one of the best choices available, they heat up quickly and evenly, not only are they economical, they will also last a long time if used and maintained properly. Regardless of the type, keep in mind that most woks have to be seasoned or "prepared" before its first use. The woks come with a protective coating applied by the manufacturers which must be removed before use. You should follow the manufacturer's instructions to do this as the procedures vary depending on the type of wok you purchase. What about handles? Some woks come with two twin handles on the side, or one long handle with a side helper handle. We prefer the long handle since it makes it easier to move, toss, and tilt when stir-frying. How big should it be? That will depend on your personal needs, will you be cooking large or small quantities of food? Keep in mind that cooking a small portion of food in a large wok is not a problem unlike a regular skillet where the small quantities would get lost in the flat surface. We find that a 12-14 inch (30-35 cm.) wok is most useful. It can be used to fit a steamer as well. With the right size, your wok can become an indispensable chinese cooking utensil that can be used to prepare every day healthy meals. Caring for your wok is quite simple. Washing it after each use with a sponge and detergent like you would a regular skillet is about it. You can pre-soak in warm water to soften any "stuck" food, and make sure you dry it thoroughly to avoid rust in some cases. It is best to read the manufacturer's instructions since there are so many different types out in the market. These choppers may seem a bit big and awkward but once you become used to one, it's hard to go back to your regular kitchen knife. 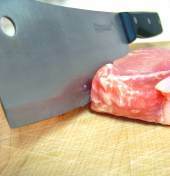 Choppers are excellent for cutting, dicing, slicing, and shredding, anything from vegetables to meats. You can also use the wide blade to carry the ingredients from the chopping board to the wok or cooking pot. Cleavers have thicker blades than choppers, they are heavier and can handle tasks like chopping through bones. Sometimes these Chinese knives have wholes on the front which are used to hang and store. Use a solid wooden chopping board to avoid a slippery surface. Chinese spatulas are frequently used for cooking and scooping in a hot wok, you can toss all the ingredients quickly and efficiently with these shovel-like utensils. Frying spoons are great for lifting items from oil, for example a whole fish or chicken pieces. They are also used frequently for straining or skimming, lifting boiling dumplings or won tons. The long cooking chopsticks are great for stir frying, beating eggs, stirring noodles and mixing ingredients. These Chinese cooking utensils are not strictly essential since you probably have something in your kitchen that can be used for these purposes. 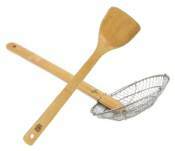 Chinese use bamboo or aluminum steamers quite often for steaming dumplings and buns, fish, meats or vegetables. Steaming is a very healthy way to cook and the different kinds of steamers are a widely used Chinese cooking equipment. In Western countries vegetables are mostly used for steaming, whereas in Chinese cooking, vegetables are usually stir fried or blanched. Chinese steam meats, fish and seafood quite frequently. Some very popular steamed dishes include steamed fish, steamed crabs and of course steamed dim sums. Traditional Chinese steamers are made of bamboo. The baskets can be stacked on top of each other, covered by a lid at the top. The bottom of the baskets woven like a grid, let the steam pass through to the whole stack of baskets which sits on a wok. The rounded bottom of the wok is filled with the boiling water. A whole meal can be prepared at one go, each dish stacked up on a separate basket and cooked all at once very efficiently. 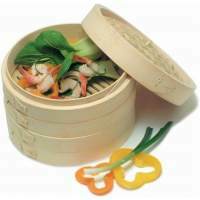 Bamboo steamers are preferable to aluminum steamers when steaming buns and dumplings because the bamboo lid lets the excess steam through instead of condensing and droping back on to the food, which could make the buns or dumplings soggy. Besides being one of the favorite Chinese cooking utensils, bamboo steamers can be used in your Western kitchen for your every day steaming needs.